WebConnect issues pop-up advertisements in order to gain online profit. This adware claims to improve your web tasks in order to trick you into installing it into the PC. WebConnect is a seemingly like useful application that mere objective is to make money through online advertising. This program is categorized as adware simply because of its strange behaviors and functionalities. WebConnect doesn�t see any compatibility issues, in fact; this is purposely designed to run smoothly within Chrome, Firefox, Edge, and Internet Explorer. WebConnect provide the best tools to enhance users browsing experience. Such feature may be sound like good offer, and most of the entire propose was free. Therefore, WebConnect is most likely to be like and install by most PC users. But, the promising offer of WebConnect was basically made to attract victims. Any of the useful function it professes doesn�t work actually as presented. WebConnect adware do perform forcefully means to enter into your computer. Top of these unlikely means is merging it along with free software. This is in fact the reason why most PC users obtained WebConnect even no one intentionally installed it. It also made them to mistakenly think that it is a virus. Despite of not being a virus or malware related, this can extremely ruin your machine if not be treated at once. WebConnect serves as a way by cyber criminals to deliver online ads. Once it delivered on target machine, it starts generating loads of unwanted ads. Clicking these ads may often redirect to malicious web site or sponsored web page. This could not give you just annoyances, but this could even lead you to acquire other forms of potentially harmful programs. - Control Panel window will open. Please proceed to the next step which is uninstalling WebConnect. 4. Select adware relevant to WebConnect or any suspicious items. Then, click on Uninstall button to remove it from Windows. To remove WebConnect, download MalwareFox Anti-Malware. This tool is effective in getting rid of Trojans, viruses and malware. 1. When troubleshooting a PC, one common step is to boot operating system into Safe Mode with Networking. The same approach will be used in the removal of WebConnect. Please execute instructions based on your Windows OS version. To make sure that no more malicious files linked to WebConnect are inside the computer, we must run another effective scanner. This time, use Junkware Removal Tool. No installation is necessary with this tool. 6. After scanning the computer, JRT will open a Notepad containing scan logs. It may have not find WebConnect relevant entities, but it will surely delete any malicious items not found in the previous scans. 4. At the bottom of the page, click on Reset settings to remove all changes made by WebConnect. 4. In order to reverse modifications caused by WebConnect, click on Reset button to bring back Internet Explorer's settings to their default condition. 3. Click on Refresh Firefox button to erase the effect of WebConnect. 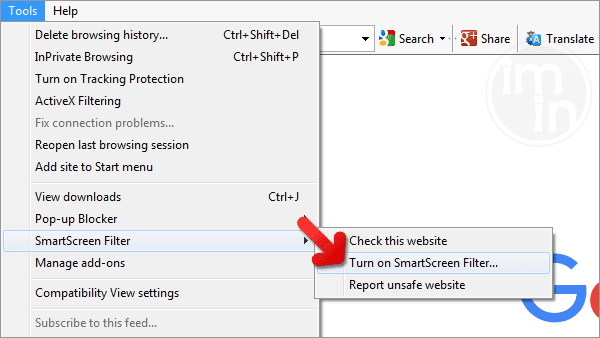 SmartScreen filter is a built-in feature in Microsoft Edge browser that can help you deter malicious programs such as WebConnect. It can block malicious web sites and downloads.